The offended CUNE comments are common in WELS, too. Of course. I didn't mean to imply that this is a problem only in the Missouri Synod. Have you read The Fire and the Staff? Excellent work on practice and doctrine. Well said. The only thing I would disagree with is in #2 when you said that worship is not an outreach tool. I think that worship (especially liturgical worship) is the ideal outreach tool. The problem is that many don't really understand what outreach (or evangelism) is. They see it as scratching the itch of someone's "felt needs" rather than proclaiming the gospel through which the Spirit creates and strengthens faith. CoWo might scratch the itch of the unchurched, but if it obscures the gospel, then it is not evangelizing - at least not to the best of our abilities. Again, I do agree that worship doesn't exist solely or even primarily for the purpose of reaching unbelievers. Otherwise, it would never dig more deeply into depths of Scripture. However, insofar as it proclaims law and gospel, it is exactly what evangelism ought to be. Point well taken. Maybe we have different understandings of "outreach." I've never understood it to be synonymous with evangelism. To me, outreach is the idea of going "out" into the community and bringing people into the church. I don't think liturgical worship is designed to do that—although when the unchurched do visit, they will of course be evangelized. As a lifelong Lutheran, I can't agree with you. There is nothing Holy or Sacred in our worship services outside of the pure Word of God. We do not worship the way that Jesus worshipped. We don't worship in the exact same manner as Luther did. Or even our grandparents. Worship styles CHANGE over time. Wrong? No. I don't want a 'feel-good' service. However, I do want a service that reflects Lutherans and true Christ-centered worship. Do Lutheran churches in other countries worship exactly like Lutherans do here? No. Their services reflect their culture. Is that wrong? 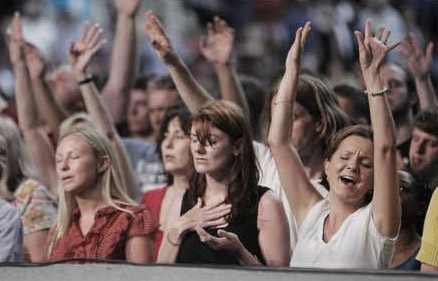 It is narrow-minded to insist that the style of worship that someone prefers, is accustomed to, and/or enjoys is the only correct way to worship, when there are so many churches out there that belong not just to a synod, but to the True Church, that preach the same Law, Gospel, and often Creeds as you. If you want to single out a specific church or worship community, and disagree with them on the basis of what their worship teaches (or doesn't teach), please educate me on that. But a large, generic, 'my way of worship is correct' does not do your intelligence justice. Anonymous, thank you for your comment. I believe you are well-intentioned, but misinformed. "There is nothing Holy or Sacred in our worship services outside of the pure Word of God." This is exactly why the historic liturgy (AKA the Mass) is pure and sacred—because it IS the Word of God. The Kyrie, Gloria in Excelsis, Agnus Dei, Sanctus, Magnificat, and Benedictus, are all inspired songs of Scripture. Nothing could be more Christ-centered. And this is why the Church has used them for almost 2,000 years, and why it continues to do so. I neither said nor implied that our worship should remain static, that it hasn't changed for 2,000 years, or that Jesus wrote the Mass (well, at least not directly). Of course liturgical worship has evolved. But its structure, the canticles, its creeds, and even many of the hymns have been passed down to us from our Christian fathers over centuries. I can open my hymnal and sing "Savior of the Nations, Come," written by Ambrose of Milan in the 4th century with a tune adapted by Johann Walther in the 16th century. Lutherans recognize that when we use the traditional liturgical rites, we are intimately connected with all believers past and present—not just our brand of Lutherans. So it is not sectarian at all—quite the opposite. You can go find Scandinavian Lutherans, Italian Catholics, and Russian Orthodox Christians using the same basic rites, although each with its own cultural flair. "It is narrow-minded to insist that the style of worship that someone prefers, is accustomed to, and/or enjoys is the only correct way to worship..."
Lutherans do not think that "their way" of worshipping is the only way—just that it is a very good way. We believe that something that is very good should not be thrown away without an equally good reason, as is explained in the Apology to the Augsburg Confession, Article XV. The purpose of this post was to contradict the notion that the "exteriors" of worship are irrelevant. Not only is this ridiculous, but it is also dangerous, because doctrine and practice are so intimately connected.